How supposedly objective textbooks made the “population bomb” as real and scary to school children in the 1960s as the H-bombs that drove them under their desks. Ronald Ladouceur is an independent scholar interested in the intersection of history, science and visual rhetoric. He is the author of “Ella Thea Smith and the Lost History of American High School Biology Textbooks,” published in the Journal of the History of Biology (2008), as well as more than 3 dozen related articles on his blog, Textbook History. Copyright © 2011 by Ron Ladouceur. Prior to World War II, America’s protectors thought its innocence could be guarded at its gates. Citizen biologists saw their country’s borders as kind of cartographic diaphragm, not entirely reliable in individual instances, but adequate to the task of containing the pool of potential breeders. Baker and Mills’ 1943 biology textbook, Dynamic Biology Today, describes the anxieties that bloomed with the airplane and its promise of more fluid mobility. 40 years after the Wright brothers’ first flight, the authors optimistically noted that, “[w]ith rapid expansion in the use of airplanes man will soon obtain a three-dimensional freedom” (484). But this freedom the authors warned would carry a heavy burden. Before there was a “space age” there was an “air age.” The image above is from Dynamic Biology Today (1943), by Arthur O. Baker and Lewis H. Mills. The “rapid expansion in the use of airplanes” would, according to the authors, usher in an era of “global living,” where “dissatisfied people living in less productive regions will tend to move to more productive regions.” The authors unselfconsciously identified a few underpopulated and soil rich regions the dissatisfied might move to … in Africa and South America (484). The post-war realization that the world was intimately interconnected manifested itself in the United States in a call to arms, a get them, or more precisely fix them, before they get us attitude. Suddenly, minor variations between classes seemed trivial relative to the resource sucking threat of the fecund of Africa, India and Puerto Rico. However, any rationalization for a war on reproduction had to address the fact that flippant disparagement of “inferior” classes, races and genders was no longer acceptable among people who had so proximately confronted the sickening consequences of the casual assumptions of Nordic superiority. Alarmists sought an alternate rationalization. Barely reconstructed eugenicists like Karl Sax led a new generation of apocalyptic writers who, just a decade away from the depleted soils of the Dust Bowl, reconceived the planet as one small, fragile and easily exhausted ecosystem. In an article titled “Population Problems,” which appeared midway through the volume The Science of Man in the World Crisis (1945), Sax repackaged key eugenic arguments in the flimsiest of “race-neutral” containers, and globalized the concern. Though he avoided the word “eugenics” throughout, Sax built his claim on the principle that had animated eugenicists since the turn of the twentieth century: specifically that natural selection’s power to progressively cleanse the species of its weak had been rendered inoperative by advances in medicine and sanitation. Western industrial societies would have to consciously compensate if they were to prevent civilization from collapsing under the weight of the “morons” who could now survive and breed thanks to the tax dollars devoted to health care and social services. 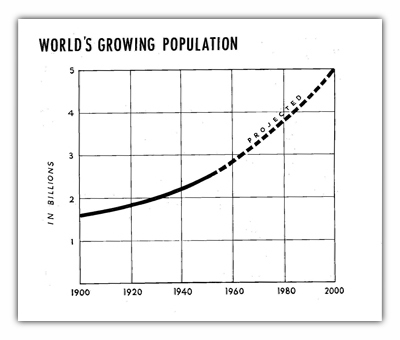 Graph of exponential population growth from Karl Sax’s pamphlet, The Population Explosion, published by the Foreign Policy Association in 1956. Sax became heavily involved with population issues in the 1950s. In 1955 he authored the book Standing Room Only, The World’s Exploding Population. It became the basis for a pamphlet published in 1956 by the Foreign Policy Association. Its title would give the world one of two excited phrases that would carry the population control movement through the 1970s – The Population Explosion. More influential than the work of Sax were two books published in 1948, William Vogt’s The Road to Survival and Fairfield Osborn’s Our Plundered Planet (see Pierre Desrochers and Christine Hoffbauer’s “The Post War Intellectual Roots of the Population Bomb”). Vogt and Osborn pioneered what later scholars have labeled “neo-Malthusian ecology” (see J. B. Foster’s, “Malthus’ Essay on Population at Age 200: A Marxian View”). 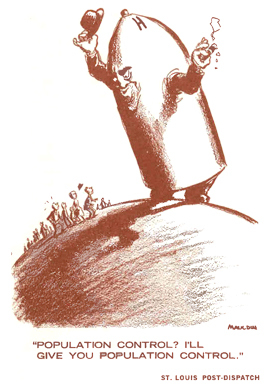 In The Challenge of Man’s Future (1954), Harrison Brown illustrated what he suggested was the “natural” course of evolution. The introduction of a disrupting force (the fox in this case) leads to increasing oscillation in the health and numbers of interdependent species which leads to a spike in growth followed by rapid decline and extinction. This graphic sequence, followed in the text by exponential curves of everything from fossil fuel use to human population growth, illustrated Brown’s theme: if reproduction and resource management were not expertly guided, evolution would soon wipe out humanity. Despite the best efforts of Sax, Vogt and Osborn, it took some time to completely sever the population control movement’s new ecological frame from its eugenic lineage. In 1954, Harrison Brown, a geochemist who had helped isolate plutonium as part of the Manhattan Project, and who would later edit the Bulletin of the Atomic Scientists, published a chilling account of resource exhaustion titled The Challenge of Man’s Future. Rather than conceptualizing natural selection as a perfecting process that had been subverted by bacteriologists and sewer workers, Brown pictured evolution as an unstable force which, left unmanaged, would drive to extinction the species progressives pictured as its crown. Industrial society, wrote Brown, was an accident of history, and the fight against evolution’s pull would “require effort of a magnitude which transcends all previous human effort” (265). In other words, according to Brown, blind nature, not human effort, had thrown up industry and civilization. People were just along for the ride. From The Challenge of Man’s Future (1954) by Harrison Brown. 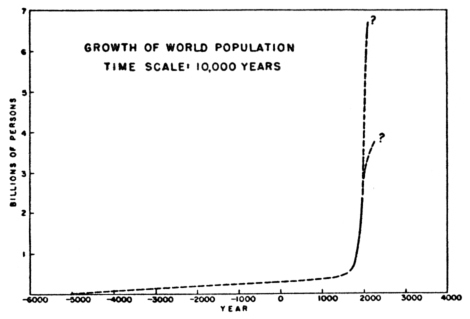 The most “explosive” (and as it turns out most accurate) prediction of human population growth to the year 2000. See the UN’s World Population to 2030 for the latest guesses on future trends. What nature had mindlessly created, Brown thought, it would also mindlessly destroy, unless a few very smart people stepped in and started managing the process. For Brown, rapid population growth was the preface to a period of rapid evolutionary oscillation that would soon shake and destroy civilization. The only thing that might slow the process down would be “a broad eugenics program … that would encourage able and healthy persons to have several offspring and discourage the unfit from breeding at excessive rates” (263). But Brown, writing in 1954, was among the last science popularizers to speak positively of eugenics, or was at least one of the last to use the word ‘eugenics’ when speaking positively of reproductive management. Growing race, class and (later) gender consciousness, along with a surprisingly slow-to-develop association between the holocaust and eugenics, rendered the word generally unacceptable by the end of the decade (see “The Day Eugenics Died”). But Bates, with considerable field experience behind him, was less inclined to the rigid “action-reaction” formulas favored by physicists. Though he considered the 2.5 billion people on the planet in 1950 as probably a million too many, he had faith in the “plasticity of culture,” and saw hope in its “unpredictability” (249). But the graphs eventually got to Bates as well. His faith in a “natural” solution soon began to oscillate in a Brownian fashion, and would not survive much into the next decade. By the time he wrote the preface to the 1962 reprint of The Prevalence of People, Bates had begun to look admiringly on the progress Japan had seen since implementing its “law of eugenic protection” in 1948. Opening spread from the original The Population Bomb, a 20-page pamphlet that would see an eventual press run of 1.5 million copies by the mid-1960s. As stated above, eugenics became a dirty word in the later 1950s. Fortunately for the alarmists, it turned out the word wasn’t required to advance the control theme. Hugh Moore, Dixie Cup magnate and pamphleteer, found he could distill the complex arguments of Sax, Vogt, Osborn and Brown down to a simple battle between good and evil, between fullness and hunger, and between freedom and Communism. The argument played well. Cleansed of its overt racist stench, the exponential curve leapt from the pamphlets of Sax and Moore to the pages of biology textbooks beginning in 1959. Yet all the old tensions remained. People were a cancer, according to Alan Gregg, medical director of the Rockefeller Foundation. And this conceptualization proved popular. But did that mean all people were a cancer? If not, who represented healthy tissue and who the tumor? And who got to decide? Eugenics, a word now unvoiced, remained embedded within the argument over population control. 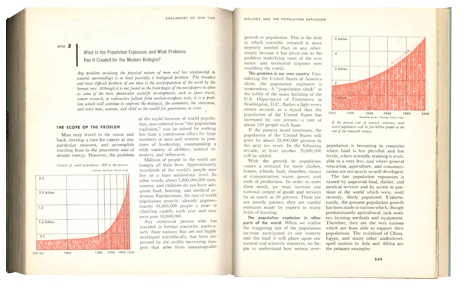 Sax and Moore’s graphs both found a home in the high school textbook New Dynamic Biology, published by Rand McNally in 1959. In the 1960s the exponential curve shot right off the page, climbing faster than the gentle arc of Sax, faster yet than the arc of Moore, to trace almost exactly the rocket-like trajectory illustrated by Brown. An icon of the era, this graph was given its most frightening exposition in Paul Ehrlich’s bestselling 1968 eco-catastrophe, The Population Bomb. But then something funny happened. The fuel ran out and, as a Google Ngram of the term “population explosion” so clearly shows, the missile began to fall. A reassessment of progressionist assumptions swept across biology, anthropology, economics and the social sciences in general, driven by a strengthening in the feminist critique pioneered by Mirra Komarovsky and Simone de Beauvoir (see related articles here and here). Graph from the 1968 edition of Biological Science: An Inquiry Into Life, more commonly known as the BSCS ‘Yellow Version’. In 1994, the Cold War conceptualization of population growth as a crisis that could be managed only by aggressive counterattack, itself came under attack. At that year’s International Conference on Population and Development in Cairo, the focus shifted from “bombs” and sterilization to women’s rights and female empowerment. Reintroduced to the debate was the “S-curve,” or the “logistic curve” first advanced by Raymond Pearl in the 1920s (see “A ‘Law of Growth’: The Logistic Curve and Population Control since World War II” by Sabine Hohler). Declining fertility rates suggested a leveling of population growth toward a new normal sometime in the following century. And it was proposed that the motor of that leveling would be increased control by women of their individual wealth and reproductive health. Today, a few observers worry that the green movement is infected by a neo-eugenic ideology, particularly when it targets the populous poor as a dangerous source of future carbon. They suggest that debate over population control should be erased from the movement’s agenda. The modern debate is captured no place better than the online journal Climate and Capitalism. Of particular note are the articles and commentary of Betsy Hartmann, director of the Population and Development Program at Hampshire College and author of Reproductive Rights and Wrongs: The Global Politics of Population Control. She and others in the journal class “Populationism” with racism, classism and sexism as conservative prejudices. The iconography of human population growth has cycled back to its pre-bomb expression. But the numbers have not changed, only how they are displayed. The consensus view is that human population will top out at slightly fewer than 10 billion people, a number that would have scared the pajamas off of Karl Sax, William Vogt, Fairfield Osborn, Marston Bates and Hugh Moore. But by focusing on growth rate rather than gross numbers, the graph suggests not an explosion, but a quieting, and oddly, an almost sad resignation. Who's Blocking U.S. Action on Climate Change? The bottom line is that we live in a finite world and there must therefore be an ultimate limit to human numbers. What that limit is I do not think anybody can predict. But I think it is correct to say that limit will be determined by the life styles adopted by the majority of humanity. The largest population will come about if the majority of humanity is following a sustainable life style. Thus we should at least pursue the widespread adoption of sustainable life styles whilst at the same time grappling with the issue of population numbers. The majority of humanity has a pretty wretched “lifestyle” at present. They work hard, they live in sparse homes, and they don’t earn enough money to be able to afford to consume much fossil fuel. Even then, however, it’s not necessarily a “sustainable” lifestyle. Their survival may be contingent on earning a pittance working in an environmentally-destructive mine or on an industrialized plantation, or cutting down forests for building materials, cooking fuel, or more land to grow food. They may eat, or trade in, endangered species of animals and fish; they may have to travel very far every day for drinking water, and dig ever deeper into the ground to find it. They may have no pensions or investments, and rely on having many children to support them when they are too old to work. They may have to buy their seeds every year from multinational agribusiness companies or drink privatized water from throwaway plastic bottles. They may be living in refugee camps because of wars or devastating climate events; they may be children working in sweat shops and agriculture to help support their families. Those of us fortunate enough to live in the highly industrialized centres of world capitalism are also limited in our lifestyle choices. Because of how our cities are designed and our food supply chain is set up, we are largely compelled to live, eat, and travel in ways that are heavily dependent on non-renewable resources and energies. We work at jobs that produce profitable commodities in unsustainable ways, because we have no control over them and because they are the only jobs available. Our ability to recycle waste is constrained by anonymous market forces that decide whether there is a profit to be made in recycling glass, aluminum foil, or plastic wrap; if not, into the landfill it goes. Our choices of products to buy and foods to consume are largely blind to the hidden environmental costs of their packaging, manufacturing, marketing, transportation, and disposal. We don’t really get to “adopt” our lifestyles – rather they are forced on people because of the way the world has been shaped by the needs and practices of global capitalism. Sustainable lifestyles for most people are impossible to “choose” without radical changes in the way we organize and govern the production of goods and services, or without empowerment and democratic control. This is the whole idea behind the expression “climate justice”. It’s not just a matter of making people want to live fulfilling lives in harmony with the environment; we have to end the systemic injustice and lack of control that prevents them from doing so. First of all, stop buying all that STUFF! And stop buying bigger houses and cars! It doesn’t make you happy. Most people are afraid that living a simpler life means unbearable sacrifice. It doesn’t. Stretch a bit and do something different. I buy used clothes, furniture, cars, appliances, I prepare my own food and live in a small house. I’m still happy. It seems that the conversation about feeding 9 billion people has carried straight over to this delightful article. I enjoyed Ladoucer’s article. Looking at the history of modern thought about population control does help put into perspective, some of the emotional reactions to statements about population control and the part different populations play in putting a burden on our resources. There is a recurring theme through modern time that some populations are more advanced, “civilized” and worthy, genetically superior while others are less developed and genetically inferior but tending to overwhelm the “better” ones with higher population growth. That idea by itself goes against the basic idea of evolution, that the more fit survive and reproduce. Talk about elitism and fear. My guess is that any “savage” people that had survived without the scientific protection of civilization, or subjugated peoples living lives of decreasing resources and higher death rate, probably kept their genetic endowment in top shape compared to those in modern society. Maybe that was the subconscious fear. Those from industrialized societies knew they no longer had the ability to survive without their civilized advantages. They subconsciously feared they were facing people who were actually genetically, more resourceful, more intelligent, and healthier. I think at least through the middle of the twentieth century, very few white Americans viewed black Africans as more resourceful, intelligent or healthier (though one textbook author characterized a group of hunters who lived on a diet of dairy, meat and blood as Apollos). From racists like Carleton Putnam (former chairman of the board of Delta airlines and author of “Race and Reason”) who said, “the progress which the pure-blooded black has made when left to himself, with a minimum of white help or hindrance, genetically or otherwise, can be measured today in the Congo,” to Truman Moon (author of the popular textbook “Biology for Beginners”) who wrote, “Some central African tribes have no houses but sleep in what are practically nests; they hunt with stone clubs, do not know the use of even the bow and arrow, cultivate no crops, and eat human flesh,” most “thinkers” just assumed blacks were a less “progressed” subspecies. Human-like animals that were at best good mimics, singers and athletes. Even liberal biologists like Bentley Glass, Hermann Muller and Julian Huxley conceded that the great differences in outward appearance of the races probably suggested great differences in inborn characteristics like intelligence and empathy (though they thought these differences could only be measured by the geneticist, not by the non-scientist using “gross” measures like skin color). But you are absolutely right that the WASPs in power worried that their tribe was growing weak. “Civilization” was the tribe’s crowing achievement, but civilization was also making its men “sissies.” Cue Theodore Roosevelt’s strenuous life and the Bernarr McFadden’s muscle magazine empire. Whites needed to join the Boy Scouts, defend the erect sequoias and work against the limpness that could be induced by central heating. The whole landscape is a Freudian field day! Well I did say “subconsciously feared.” Why else would whites refuse to play sports with people of color for so long? (Too bad those upright “men” didn’t do a better job of defending the sequoias.) I got a good laugh from your last couple of sentences! I have to laugh or I’ll cry. Is that a left over from the institution of slavery? Maybe a person looks too “primitive” when seen doing physical work or handling physical objects? The upper classes don’t do physical labor or work with their hands so in order to look cultured and civilized, get someone else to put in the bodily effort. It is OK to indulge in physical activity or do hand work as a hobby or means to physical health but it shouldn’t be a way of life! It is actually shocking to many people to discover the person mowing their lawn or fixing the plumbing is well read and knowledgeable or possesses a high IQ. So we find it acceptable that the most “advanced” and deserving of human beings would accumulate the most money and power by gambling with the lives and resources of those less civilized . The Greeks codified our progressionist prejudices, though they probably didn’t invent them. The idea that “lower” people labor and “higher” people think goes back to at least Aristotle (and probably much earlier). Your “subconsciously feared” point is interesting, and likely true. I should have acknowledged it in my first reply. However, it is hard to separate, at least through textbooks and the other documents I am familiar with, a fear of being shown up from fear of being “soiled.” Were athletes fearful of being measured against those that they “needed” to have in inferior social positions? Maybe. As likely I think, athletes and others refused to integrate their teams for fear that their already marginal laborer’s social status would be eroded further through simple association with people “everyone knew” were inferior (despite their “specialized” physical skills – with a bat, basketball, double bass, etc.). Very good point! Hadn’t thought of that, fear of association. I’ll keep that in mind. As far back as the Greeks? Darn! Personally, I find tradespersons, artisans and craftspersons to be some of the most intelligent people I know. They were after all, the first scientists, engineers, chemists and technicians. Try learning kiln fired glass painting on stained glass windows, let alone developing such a craft. Talk about observation, hypothesis, experimentation, logic and understanding process and systems. That doesn’t even cover getting your body to cooperate in learning very subtle skills based on an intuitive artistic “feel” for the medium. Of course plumbers, stonemasons, blacksmiths, artists, woodworkers do get very “dirty.” I sometimes feel that is an issue as well. Fear of contamination may be “built in” but how it is specifically expressed in an individual is learned I imagine.